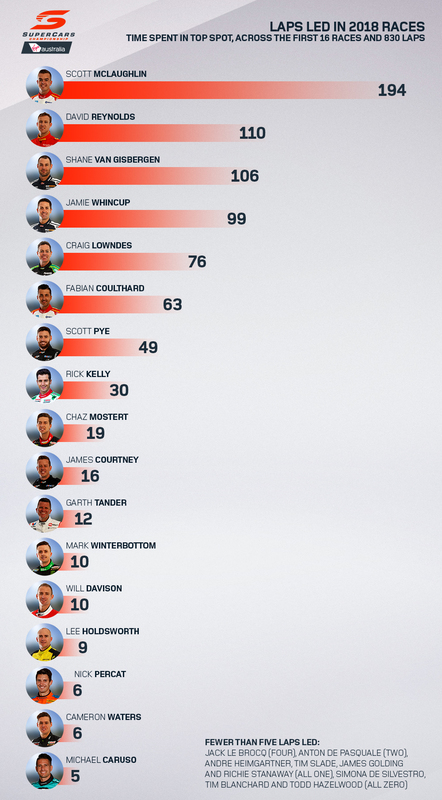 Supercars championship leader Scott McLaughlin’s strong start to 2018 is underlined by a closer look at how many laps drivers have spent in each position. The Shell V-Power Racing driver has led 194 of this year’s 830 racing laps, a total of 23.37%, and spent 473 laps in the top three, 56.99%. Across the first 16 races of the campaign, McLaughlin has only spent 140 laps – 16.87% – outside of the top 10. McLaughlin’s tally of 194 laps led is 84 clear of the next-best driver, Erebus Motorsport’s David Reynolds on 110. The Penrite Holden led the most laps in both races at Hidden Valley last time out, 20 on Saturday and 57 on Sunday. That haul of 77 vaulted Reynolds up the laps-led order, past Shane van Gisbergen, Jamie Whincup, Craig Lowndes, Fabian Coulthard and Scott Pye. The most laps led by a driver during any given weekend is McLaughlin’s 86 at Barbagallo Raceway, where he won both races. Reynolds in Darwin is next on 77, followed by van Gisbergen’s 76 in Adelaide and 72 for Lowndes – all on the Sunday – at Symmons Plains. While McLaughlin heads to the Watpac Townsville 400 with a 161-point championship lead over van Gisbergen, his statistics on laps led and in the top three are actually down on 2017. 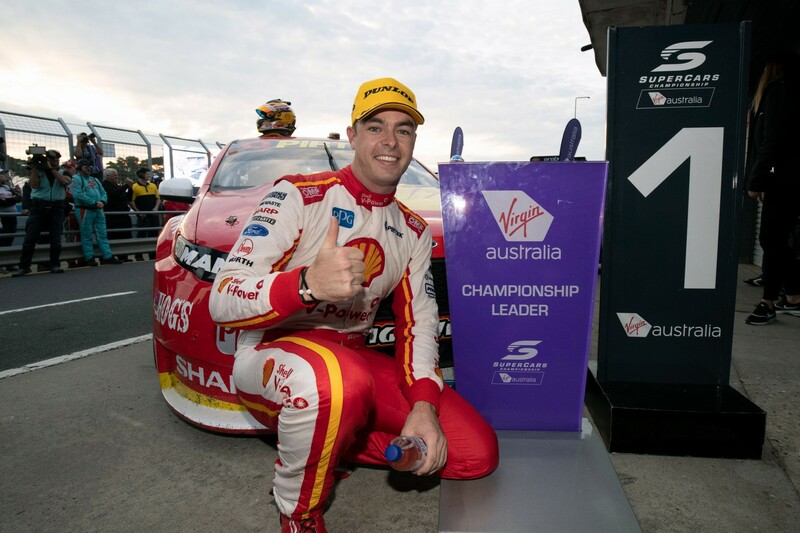 After the Hidden Valley event last year – with Albert Park a non-points event in 2017 – McLaughlin had led 42.56% of the racing laps and spent 71.36% of them in the top three. Across all of the 2017 season’s single-driver races, his tallies were 30.26% and 61.34% respectively. 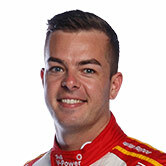 McLaughlin's podium finish hit-rate in 2018 – 11 from 16 starts – is up on the same point last year, 68.75% from 61.54%. 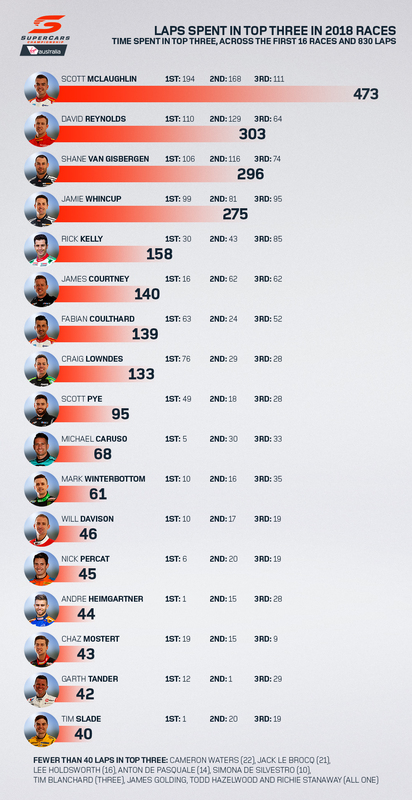 A 2018 table of the drivers to have spent the most laps inside the top three places has a similar look at the top end. McLaughlin on 473 leads Reynolds on 303 and Red Bull HRT team-mates van Gisbergen and Whincup on 296 and 275 respectively. The big movers are Rick Kelly and James Courtney in fifth and sixth, having been eighth and 10th on laps led. Castrol Nissan driver Kelly has spent 30 laps in first position – 21 of those in the Sunday Phillip Island race – and a further 128 in second or third for his tally of 158. The 16 laps Courtney has led in his Mobil 1 Boost Mobile Commodore all came in the very first race of the season in Adelaide. He has another 62 laps in both second and third places to his name across the first seven events of the year to reach 140. Of the five rookies in the field, Jack Le Brocq has led twice, for two laps each during pitstop cycles at Symmons Plains and Winton, while Anton De Pasquale led a single lap in Adelaide another at Phillip Island. Tekno’s Le Brocq has spent 180 of the year’s 830 racing laps in the top 10, with De Pasquale’s tally 140.